(verb) Mantling is hunching or arching shoulders and spreading wings over a recent kill to conceal it from other birds and predators who would be potential thieves. In this posture, the wings are mostly spread and drooped to the ground, exposing the bird's upper back, also called the mantle, which gives the action its name. The head is usually bent down to feed, and the tail is often spread and drooped to provide additional cover and counterbalance. Many birds of prey, including hawks and falcons, practice mantling after a kill. While they are feeding on the ground, particularly in open fields, rocky ground, or similar areas with less shelter or cover to provide natural concealment, they are more exposed. Their instinct is to cover their prey and keep it out of sight so it is not stolen by a larger, more powerful predator, whether that is another raptor or any other type of lurking hunter or scavenger. At the same time, the mantling bird will eat rapidly in order to decrease the time they are vulnerable, storing large bites of meat in their crop for later digestion when they feel more secure and are not at risk of losing the meal. While mantling, the feeding birds may exhibit other nervous behavior. They may frequently look around the surrounding area to scan for intruders, or shuffle their feet to continually readjust the mantling cover to disrupt views from different directions. This also helps them get a firmer grip on their prey for easier feeding or to try and move it if they are assaulted. Birds of prey put enormous efforts into each hunt, and success rates vary from as high as 85 percent to as low as 10 percent. Birds frequently seen mantling are often larger species that typically have lower hunt success rates and more reason to guard a successful kill fiercely. Larger raptors such as red-tailed hawks, peregrine falcons, and similar species are also more likely to hunt larger prey and must feed on the ground. These birds therefore use mantling much more often, as it is more difficult to carry their prey to a protected perch. Smaller raptors such as kestrels and shrikes can carry their prey, such as insects, mice, lizards, and similar small animals, and do not need to mantle to protect their meal. In the nest, young hawks may mantle over prey their parents provide. Even if the prey is already dead, this action guards the food from hungry siblings as these young birds become more independent and rely more on their own hunting instincts. 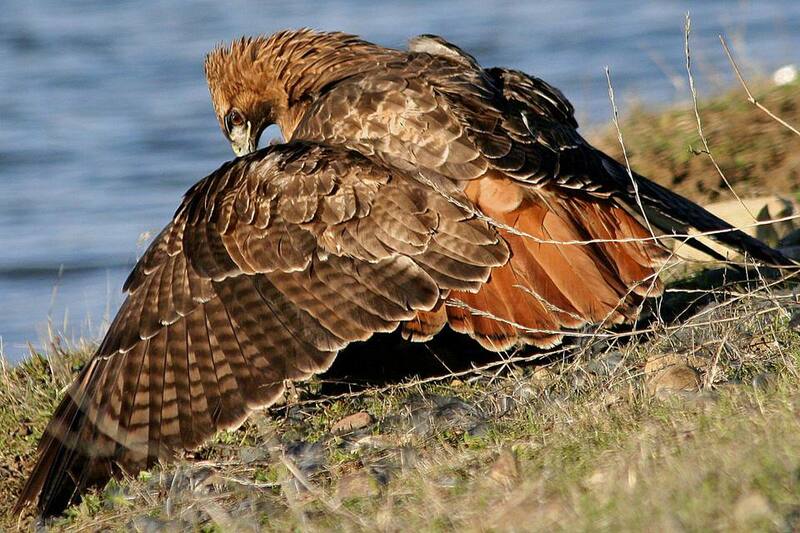 In some cases, scavenging raptors will mantle over carrion. Even though they did not kill the prey, their instinct to protect it and keep it away from other scavengers is the same. Birds that regularly feed on carrion, however, such as vultures or caracaras, do not usually display mantling behavior. These scavengers are communal feeders and are more likely to feed in large flocks, with many birds taking advantage of the same food source. Birders who see a raptor mantling should keep their distance and leave the bird undisturbed to enjoy its meal. Because it can be so difficult for raptors to hunt successfully, they are more skittish and feel more vulnerable while mantling, and if disturbed, may abandon the food. This wastes the effort they've used, and deprives them of the nourishment they have already captured. Their next hunt may not be as successful, and particularly if they already feel unsettled, they may be less able to replace the lost food. This can be especially critical from late spring to late fall, when raptors may be hunting for their offspring and young birds require more frequent meals for adequate nourishment. Finding a mantling bird gives birders a unique opportunity to properly identify the bird of prey. Not only is the bird likely to remain in one spot as it feeds, therefore allowing birders to observe the bird carefully with a spotting scope or taking numerous photographs, but its posture allows field marks to be easily seen. Look at the colors and markings on the bird's spread wings and tail as well as its rump and back, but be aware that the mantling posture may distort an observer's perception of the bird's overall size or shape. If the prey can be seen at all, it can be another clue to the bird's identity. What Is the Mantle of a Bird?